Scalable economic solutions are needed for the manufacture of cell and gene therapies if they are to be commercially viable. Many new allogenic and autologous cell therapies are undergoing clinical trial, with the number of approved products expected to increase. As the industry moves towards commercial manufacture, developers must scale-up or scale-out their processes to meet patient population demands. However, a lack of cost-driven, scalable solutions for cell and gene therapy manufacture is a major barrier to the industry. The use of stirred tank bioreactors (STRs) is well established in the biopharmaceutical industry. Advantages include scalability and ability of single-use STR systems to produce high cell yield as well as being low in cost and complexity. 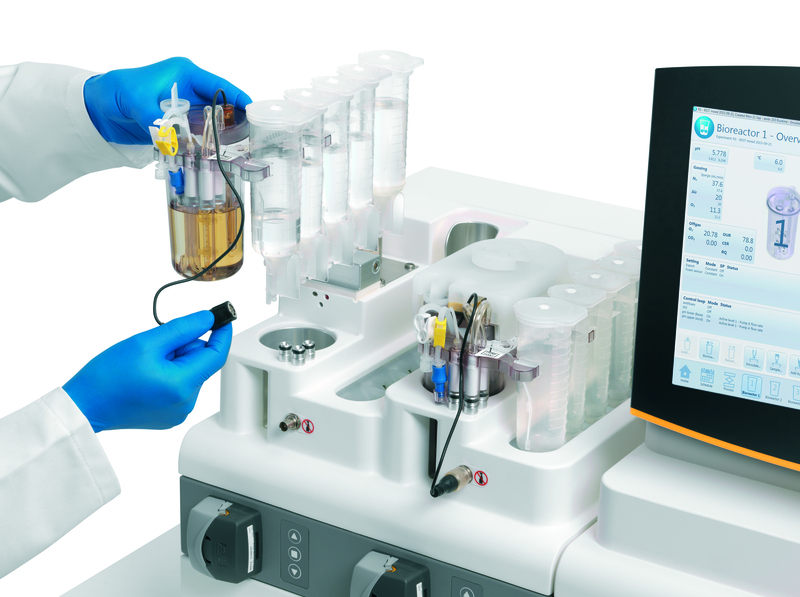 Sartorius Stedim Biotech (based in Royston, UK) have developed the ambr® 250 modular single-use bioreactor for process development, and it could potentially be used for cell therapies. CGT Catapult was tasked with evaluating the new product for its possible use in regenerative medicine applications. The team at CGT Catapult assessed the similarity of the ambr 250 modular bioreactor against their in-house standard culture vessels for allogeneic scale-up, and autologous scale-out. The team used both Design of Experiments (DOE) and simulation techniques to investigate the performance of the different bioreactors for allogenic MSC stem cell therapies and autologous T-cell immunotherapies. When investigating the culture of MSCs grown on microcarriers, the 250mL ambr 250 modular showed excellent scalability to an established 3L bioreactor platform for cell density and viability. When studying the culture of T-cells for autologous immunotherapy the ambr 250 modular produced a much higher cell density than the static (bag) culture. Furthermore, the CD8 to CD4 ratio in the final yield increased when each were operated as stirred systems, indicating potential benefits in agitation when looking to generate a more balanced expanded population. Previously the industry had avoided expansion of T-cells using stirred tank reactors due to the potential shear stress experienced by the cells. We have shown that for an autologous T-cell therapy the ambr 250 modular bioreactor can generate a clinically relevant cell number of >1.5 billion cells in a single vessel. This project has identified a platform to drive the scalable manufacture of both autologous and allogenic therapies and this information can now be used by cell therapy developers as they plan the scale-up and scale-out of cell therapy production. Stirred tank bioreactors can be integrated into automated manufacturing platforms to drive the expansion step and CGT Catapult is now investigating the addition of smart process controls to stirred tank bioreactors.